Life is the search for that which is lost, for we each have within us our own personal quest. What we seek is unknown to us, but still we strive onwards. Our aims, wen though we are not consciously aware of them, have a great effect on our lives, governing the way we think and the actions we take. Each of them personal, individual and indefinable. The difficulty in expressing and explaining the search has resulted in the generation of much of the mythology of the past, producing many varied and diverse retelling of what is basically the same story. Over and aver again, it is repeated throughout history. The theme, beneath its constantly changing trappings, always remains the same. Each an attempt by an individual, or a group, to describe the indescribable quest, each a reflection, and only a reflection, of the urge to know the unknowable. The pattern of the search is cyclic. One starts at the beginning and progresses, only to return to the point of origin. 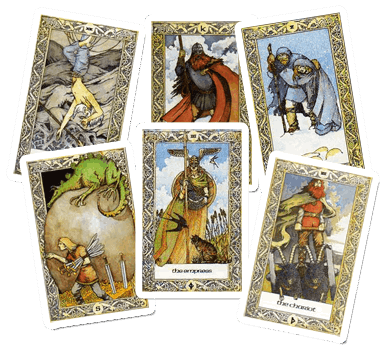 The search is illustrated perfectly in the Major Arcana a of the Tarot - the Fool begins his adventure with no knowledge of what is to come. In human form he is the very essence of inexperience. Moving through the cards he gains knowledge and wisdom, understanding and compassion; he experiences the heights of joy and the depths of despair. Ultimately he sheds his earthly pleasures and attributes to reach perfection and completion. But just what does he achieve. Not only his method, but also his final achievement is veiled in mystery, open to a mixed and varied interpretation.